Shea butter has anti-inflammatory properties that is widely known to heal scrapes, cuts and burns. It relieves sunburns, rashes and insect bites, eases the pain from muscle fatigue and arthritis. Improves skin conditions and contributes to hair growth; a natural conditioner for the hair. Shea butter has been used for decades as a wrinkle reducer and contains essential fatty acids which helps in maintaining the skin's elasticity. It also has substantial anti-aging properties; which assists in rebuilding and rejuvenating collagen. 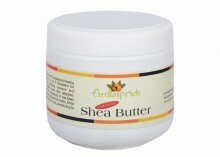 It has a profile of Vitamins A, E & F.
Click the button below to add the Unrefined Shea Butter to your wish list.